If you want to reduce or eliminate your reliance on prescription eyewear, LASIK is often considered the go-to vision correction surgery. However, LASIK may not be the best option for everyone, as certain eye conditions can impact your candidacy for LASIK. Many of our patients at Riverside EyeCare Professionals who want to improve their vision have either severe refractive errors or an abnormally-shaped cornea, making them ineligible for LASIK and LASIK alternatives, such as PRK. For these patients, Refractive Lens Exchange (RLE), also known as lens replacement surgery, may be an effective alternative for dramatically improving their vision. An alternative for LASIK and other laser vision correction surgeries, RLE can achieve a very similar outcome. As an added benefit, RLE can often be performed in conjunction with cataract surgery, allowing your board-certified ophthalmologist to remove the cataract while also correcting other vision impairments. During the consultation process, we will perform an eye exam, review your medical history, present you with your treatment options, and help you make an informed decision about your eyesight and your health. To learn more about the vision correction options offered at Riverside EyeCare Professionals, or to schedule a consultation, please contact us today. Is LASIK as Safe as Wearing Contact Lenses? A common question we hear in the office is whether or not LASIK is considered as safe as contact lenses. According to a study1 published in the Journal of Cataract and Refractive Surgery, the risk of vision complications and/or loss associated with LASIK surgery and long-term contact lens wear may actually be closer than what is widely assumed. 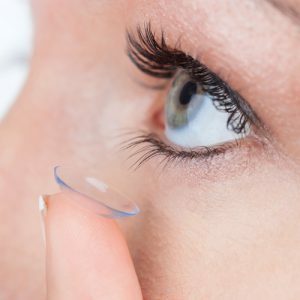 A key reason for these findings is that contacts require the use of one’s fingers to insert the lens into the eye, which could introduce bacteria and possibly lead to infection. Additionally, many people have the tendency to over-wear their contacts (such as sleeping in them at night) and/or not follow proper cleaning instructions recommended by their eye doctor, both of which can be detrimental in the long-run. In contrast, LASIK surgery doesn’t require finger-to-eye contact or lens cleaning on an everyday basis, helping to diminish the risks associated with these actions. Thanks to significant advancements in laser technology and precision, the LASIK procedure is also considered safer than ever before, enabling patients to enjoy a lifetime of clearer vision with reduced dependency on corrective eyewear. Ultimately, both contact lenses and LASIK surgery can be safe and effective vision correction options for the right candidates. If you are interested in improving the quality of your eyesight, I strongly encourage that you seek the expertise of an experienced board-certified ophthalmologist to find out which method may be best for your unique needs. If you are interested in vision correction of any form and would like to schedule an appointment with Dr. Sumsion, please contact us today. If you have been considering LASIK to correct your vision and get rid of your glasses and/or contacts, we can help! We are currently offering FREE consultations for anyone who is interested in finding out if LASIK is right for them. With LASIK vision correction, you can safely and effectively improve your vision and reduce or eliminate your dependence on corrective eyewear. Please contact Riverside EyeCare today to schedule your consultation! Dr. Michael Sumsion uses iLASIK all-laser technology for the LASIK procedure, which allows him to provide patients with the best possible results after surgery. This advanced process is designed to provide personalized results, improving vision for patients with conditions such as nearsightedness, farsightedness, and astigmatism. The iLASIK technology can produce very precise and accurate outcomes, and does not require a surgical blade to come anywhere near the eye. To learn more about iLASIK, or to schedule your complimentary LASIK consultation, please contact us today.